A new aluminium alloy wheel manufacturing plant (252m x 105m). Aluminium will be supplied from the existing smelter. Power will be provided from the sites existing 100MW Hydro and 18MW Bio Fuel supplies and import/export from SSE’s 33KV Connection. 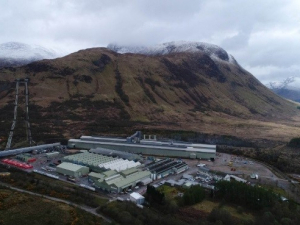 The plant will utilise a Biomass CHP unit to provide hot water at 350° C.
In addition, the client is developing a new 150MW Windfarm north of the site that will be used for exporting electricity back the SSE’s Grid.